"El Capitan, the great big granite monolith in Yosemite Valley that apparently attracts all kinds of nuts who want to die horrible, splattering deaths — I mean, mountain climbers, it attracts lots of mountain climbers." — The Agony Booth, Star Trek V: The Final Frontier recap. Whenever an obstacle arises in an action or adventure story, it is usually this. Often encountered on the way into Mordor, it is also found in urban settings. Cliffs of Insanity can be natural or man-made; if the latter, they may involve Le Parkour or a Clock Tower. What they all have in common, however, are the invisible arrows shouting "The plot goes this way." To simply go around (or take the elevator/tram ride) would be inconceivable. One must take them head-on; and just to be sporting, with whatever safety equipment they didn't think to bring along with them ahead of time. Whether or not he was known to be in the area, the villain will invariably Cut the Safety Rope before the hero can make it to the top. Fortunately, the hero will grab a ledge or something and reappear. He/she will invariably need an assist for the last 5 feet of the climb. If the hero or villain is being pursued, he will invariably pick the tallest point in the landscape and climb that (although that is a trope in itself). And at some point in the climb, expect to see a Plummet Perspective to emphasize the danger if the climber should fall. This is a super trope dealing with Insane Precipices. This deals with the strange properties of these (mostly) fictional features, such as their apparent unavoidability. Bizarrely averted in Role Playing Games by Insurmountable Waist-High Fence, which is the opposite of this trope. Usually involved in a Climbing Climax. Not to be confused with Mountains of Madness. See also It's All Upstairs from Here and Scaling the Summit. One Piece during the Drum Island Arc takes this to its worst. Luffy, in the middle of a blizzard, carrying a sick Nami and an injured Sanji (with his mouth), has to climb a nearly flat mountain that inclines directly upwards. This takes several episodes. At one point, Luffy's fingers explode in blood and he ends up sliding down a whole fraction of the mountain, blood flying everywhere, Luffy unable to even scream less Sanji drops from his mouth, until he finally regains his grip. This is truly one of the most painful scenes to see in the entire anime and easily turned Luffy into The Determinator. Over a decade before the start of the series, Fisher Tiger climbed the Red Line with nothing but his bare hands to attack the world capital Mariejois. The Red Line is a sheer cliff over 6 miles tall. In Sin City, Marv has to get to his parole officer's highrise apartment but there's a man hunt for him going on. How does he get up there? Simple. He climbs up the side of a building with his bare hands. The Trope Namer is The Princess Bride. Buttercup's kidnappers climb the Cliffs of Insanity to escape pursuit (thinking no one else will be able to climb them), but of course the Man in Black isn't ready to give up that easily. Played for laughs in "Erikthe Viking" Where Erik uses grappling hooks to scale the tower where Prince Aud lives, only to have her ask, "Why didn't you take the stairs?" The embassy in The Bourne Identity. The Statue of Liberty in Remo Williams: The Adventure Begins. For Your Eyes Only: James Bond climbs a mountain in order to reach the Big Bad's hideout monastery at the top. In 300, Leonidas has to climb one in order to reach the Temple of the Ephors, because as we all know Spartans are too manly for Handicapped Access. It is not said if this is the only route, or Leonidas is just showing off. In Troy similar to the above example, Achilles proves he is no slouch by climbing up the side of the Trojan citadel while all the other Greek troops use the main entrance. Cliffhanger, of course. The protagonist is even a mountain climber. Mission: Impossible  Ghost Protocol. Ethan Hunt has to climb up the outside of the Burj Khalifa in Dubai, using adhesive gloves, cut his way in through a window, then come back down again. And this isn't part of a mission he's had time to psych himself up for either, but an Indy Ploy when something goes wrong. Before that, Mission: Impossible II had Ethan climbing an Utah mountain barehanded before he gets his mission briefing. Keep in mind he was doing that for fun. He was on vacation. In Beyond Sherwood Forest, Robin has to climb an almost sheer cliff in order to obtain the fruit that will allow Alina to regain her mortality. The stairs of Cirith Ungol in The Lord of the Rings (and the film of the book). Gollum leads Sam and Frodo up this way because the main entrance to Mordor is too well guarded and fortified for them to be able to sneak in. Unfortunately, there's something horrible at the top. The climb from the Gates of the Moon to the Eyrie is steep, narrow and tremendously perilous. Any pretensions of bravery or saving face are swept aside by the treacherous side winds and the ever narrowing path. Because of these facts, the Eyrie is said to be impregnable from invasion by land. The Wall is an Ice Wall Of Insanity in the eyes of the wildlings. 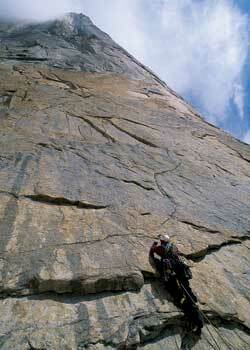 Nevertheless they climb it, using ropes, stakes and ice axes. Sometimes they fall too, as the Wall has a nasty habit of cracking off great sheets of ice in what may be a magical defense against those who attempt to breach it. In The Guns of Navarone, a commando team has to scale a steep cliff to get onto an island and destroy the German artillery emplacement that is fortified there. High Citadel by Desmond Bagley. When their plane crashes into the Andes after a failed hijack, the survivors have to fend off communist rebels while three of their group attempt to scale a previously impassable mountain using improvised climbing equipment in order to get help. Duncan Idaho scales a cliff several miles high in God-Emperor of Dune with no gear at all, a feat so impressive that one female onlooker reacts quite enthusiastically when he reaches the top. In Warrior Cats, it seems like the only way to travel through the mountains is to walk along narrow cliffs. Naturally, there's a couple Literal Cliffhangers and a minor character's Disney Villain Death. The classic children's story We're Going on a Bear Hunt. There's only one way out of the isolated seaside village in Son, and that's by climbing the tremendous cliffs that surround it. Only one person has ever made it to the top, and he came back with a crippled foot. Claire becomes the second person to reach the top and the first to leave the community. Her training for, and the torturous climb itself, is the subject of nearly an entire section. In High Time to Kill, a plane carrying an important formula crashes near the summit of Kangchenjunga, the third highest mountain in the world. James Bond is sent there in an expedition to retrieve the formula along with his newly-introduced lifelong rival, who just happens to be an expert in mountain climbing. In the Season Four finale of Angel, the titular vampire hero has to climb (without equipment, but, hey, he's a vampire) insanely tall cliffs in a hell dimension in order to reach a temple which houses the only creature to know Jasmine's true name. Inverted on a late-Season 2 episode of The A-Team: the A-Team had to scale down a cliff in order to escape the bad guys. This is a common task on The Amazing Race, where teams have to climb to the top of something to retrieve their clue. Game of Thrones: The primary way wildling raiders bypass the 700-foot Wall. Bonus points for it being made of ice and having a nasty habit of cracking off in great sheets. Jon himself makes the ascent in "The Climb". In an episode of Legend of the Seeker, "Eternity", Richard and Kahlan encounter cliffs of insanity that double as the wall around the world magical valley and try to climb over them. Naturally, there's a Literal Cliffhanger moment. Bally's Paragon includes the Golden Cliffs, and reaching the summit scores the Cliff bonus. You climb some high cliffs at two points in Final Fantasy VII. When you're doing it the second time you're constantly losing body heat, so you have to stop on ledges to heat yourself up occasionally. The cliffs to Manhannan's house in King's Quest III. This was one of the last times that Sierra made you navigate a maze with the arrow keys, where the slightest misstep led to instant death. And you had to do this every time you needed to enter or leave the house, which you had to do all the time. The Cliffs of Logic in King's Quest VI: half puzzle sequence, half Copy Protection! Naturally, if you get a certain puzzle wrong, you tumble to your death. The cliffs in Peasant's Quest. The Cliffs of Madness in God of War could almost be the Trope Namer. The ladder sequence in Metal Gear Solid 3: Snake Eater. This has to be done in order to get the Blue Feather in Harvest Moon: Magical Melody. Fallout: New Vegas: Honest Hearts, in addition to being a River of Insanity expedition, has a lot of cliff climbing. Grandia has a man-made version in the form of an absurdly high wall that apparently spans the entire width of a continent, known as "The End of the World". Everybody else deems it an impassible barrier, but the game's hero instead just climbs over it (which takes several days). In Season 1 of Within the Wires, this is Invoked in "Cassette #4: Sadness, Lungs," by its Narrator, who uses a visualization exercise as a pretext to prepare their listener, a patient at a research hospital, for a difficult phase once they've eventually Escaped from the Lab. Narrator: Remember: the cave is high, and it is hidden, and it is difficult to get to. Falling water thunders past you and sprays you as you climb. The slope is slippery and your clothes are wet. It is difficult, but freedom always is. The infamous 1972 crash of Uruguayan Air Force Flight 571.note Players and various staff members for the alumni rugby team of a Catholic school in Montevideo survive for over two months by eating the bodies of the deceased.Realizing that rescue searches were over, two team members walked over the Andes mountains into Chile to summon help. This was recreated in the 1993 film Alive. K2 is the world's second highest mountain and considered a more difficult climb than Everest due to the extremely steep and technical climb. Also it tends to have powerful storms that last several days. There is a reason it has the second highest fatality rate of any mountain. And why, uniquely among the major mountains of the world, it has never been successfully climbed in winter. And as people think it's fun to go there, that gives "insanity" a whole new meaning. Trango Tower in Pakistan, pictured above, a collection of needle-shaped monoliths, is the world's tallest sheer cliff. Yungas Road of Bolivia (usually referred to as El Camino de la Muerte), the most dangerous road in the world, with a yearly death toll of 300. It is built into a cliff face, is only 4m wide, has no guard rails at all, and attempting to pass (any time you meet a car traveling in the opposite direction, which is quite often) can easily send your car over the side and down a 600 m plunge. El Capitan and Half Dome in Yosemite National Park most definitely qualify. During the Invasion of Normandy during World War II, US Army Rangers of the 2nd Ranger Battalion supporting the landings on Utah and Omaha Beach were ordered to scale Pointe du Hoc, a 100-foot promontory situated between the Utah and Omaha landing sites, and seize the battery positioned there. In truth the guns had been moved a mile inland (contrary to popular myth, the commanders of the assault were fully aware of this, though as shown in The Longest Day the Rangers themselves weren't notified). The 2nd Rangers ultimately suffered nearly 50% casualties scaling the cliffs and seizing the bunkers there, denying their use by German artillery observers. Devil's Tower (Bear Lodge) in Wyoming is climbed by many people. Looking up at it, it even looks like the Cliffs of Insanity. China's Mount Hua (Hua Shan) is home to the world's most dangerous hiking trail.